Belfast born Frank Carson died at his home in Blackpool surrounded by his children, Grand Children and Great Grand Child. He had been ill for some months but died peacefully. Frank will be remembered not only for his career in show business but also his charity work, for which he was honoured with a papal knighthood from Pope John Paul II. He never lost touch with his roots in the St Patrick area of Belfast, then known as 'Little Italy'; he was of Italian descent his grandmother being from Sicily. He was a choir-boy in St Patrick's Church. He had a varied early career working as an electrician, a plasterer at a time when jobs for Catholics were scarce. He spent three years in the Parachute Regiment mainly in the Middle East in the late 1940's. During his service he assisted with the clear-up after the King David Hotel bombing in Jerusalem and made 40 parachute jumps. Frank became a popular entertainer in Irish TV before moving to England. 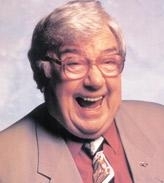 He had success in the long running television music-hall show The Good Old Days. However, his big-break came when he won the talent show Opportunity Knocks. He was also one of the more prominent acts on The Comedians. In 1976 he had heart surgery and was advised to retire. Not Frank! He continued and became a regular on the ATV children's show Tiswas. He spent some time in Balbriggan where he was Mayor. He lived, with his family, for some time in Liverpool then moved to Blackpool. Among the many charitable causes with which he was connected were the Royal Victoria Children's Hospital in Liverpool. He took part in the TV programme Cash In The Attic to raise money for a local hospice. He also worked with Baroness May Blood on an integrated education fund. Baroness Blood said "We will really miss Frank. He was always there to help us. If we had a new idea and he could help us financially or by opening a door, he was there." Frank had suffered a serious illness in 2009, but kept active until a few months ago. He is survived by his wife, Ruth, their three children Majella, Tony and Aidan, 10 grandchildren and one Great Grandson. Frank will be buried in Belfast from the Church in which he was a choir-boy and in which he was married.